Bobby Rush, Bettye LaVette, & Ruthie Foster headline this year's Chicago Blues Festival! With a diverse lineup celebrating the blues’ past, present and future, the Chicago Blues Festival features live music performances on multiple stages in Millennium Park. Each year national and local artists headline the event on the Jay Pritzker Pavilion stage to celebrate the city’s rich Blues tradition while shining a spotlight on the genre’s contributions to soul, R&B, gospel, rock hip-hop and more. WDCB will again serve as a media sponsor for the festival, with our blues radio hosts emceeing shows on multiple stages during the event. Bobby Rush will headline the festival on Friday, June 7, at the Jay Pritzker Pavilion. The GRAMMY® Award-winning artist was named by Rolling Stone "The King of the Chitlin' Circuit" for his vigorous touring schedule and energetic show. Before Bobby Rush takes the stage, the Jimmy Johnson Blues Band will mark Mr. Johnson’s 90th birthday. Johnson has been one of the Chicago scene’s leading blues guitarists & singers since the 1970s. The evening will lead off with Charlie Musselwhite joined by special guest Billy Boy Arnold. The famed harp player has jammed on stage with all the greats. Shortly before winning the GRAMMY® Award for Best Blues Album for their collaboration “Get Up!,” he and Ben Harper played at the White House for President Obama and the First Lady in a salute to Memphis soul. On Saturday, June 8, award winning and legendary soul artist Bettye LaVette will headline the Jay Pritzker Pavilion stage. One of the very few of her contemporaries who were recording during the birth of soul music in the 60s, LaVette is still creating vital recordings today. Opening the evening’s showcase are Don Bryant and Latimore. Don Bryant started his career as a gospel music artist at an early age and found soul at Hi Records in Memphis, TN. Bryant recently gained a new generation of fans when he recorded the comeback album “Don’t Give Up On Me” with the Memphis-based soul homage outfit, The Bo-Keys in 2017. Blues Hall of Famer Latimore, best known for his r&b hits like “Let’s Straighten It Out” and “Take Me to the Mountaintop,” will kick off the stage. On Sunday, June 9, Ruthie Foster will headline the closing night of the festival. The award-winning artist’s latest album “Joy Comes Back,” described as “some folk, some blues, some soul, some rock, some gospel,” illustrates Ruthie’s genre-spanning talent. Also on the bill, a special tribute set for the late Mike Ledbetter by The CONNECTION with Mike Welch and Friends. Mike Ledbetter had been invited to perform at this year’s festival with the Welch–Ledbetter Connection before his untimely death in January. Larkin Poe, the American roots sister duo poised to make their mark with the 2018 release of “Venom & Faith,” will open the stage on the final evening. The Chicago Blues Festival is FREE and open from 11 a.m. to 9 p.m. daily in Millennium Park. 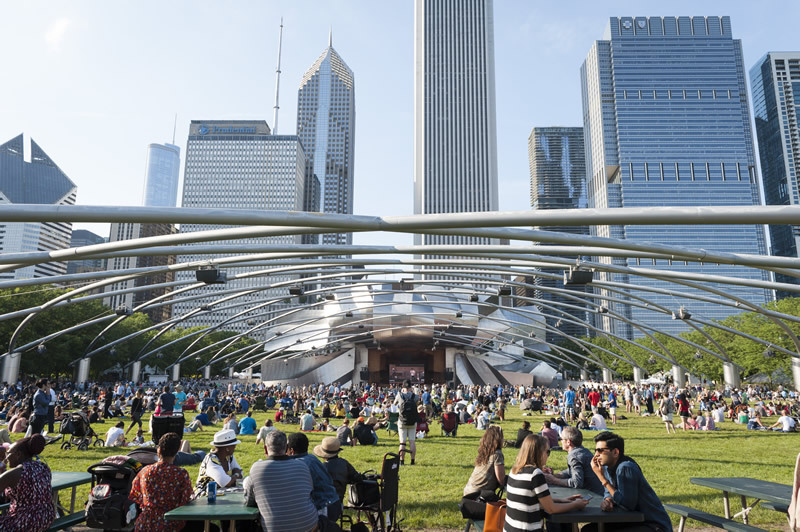 In addition to the Jay Pritzker Pavilion headliners featured nightly, music begins each day at 11 a.m. at the Budweiser Crossroads Stage, the Visit Mississippi Juke Joint, the Front Porch and the Park Grill Stage. The full schedule of performances will be announced this spring. For complete details, visit chicagobluesfestival.us, join the conversation on Facebook at Chicago Blues Festival and follow us on Twitter, Instagram and Snapchat @ChicagoDCASE (#ChiBluesFest).